Casual yet delicate, this stationary sofa is framed by tall wood legs and flair tapered arms for a clean, contemporary style that will update any room. 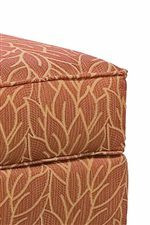 Also comfortable, this couch is upholstered with plush box-faced seat cushions and a padded camel back for the soft support you need to truly relax. 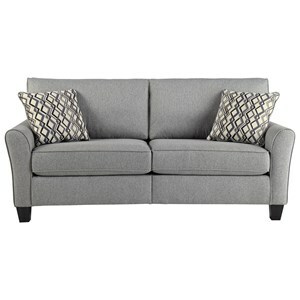 With the addition of decorative accent pillows for added style and support, you are sure to enjoy the ultimate lounge experience with this sofa. 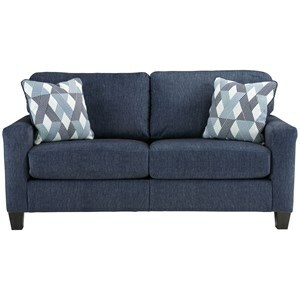 Whether relaxing in front of the TV or socializing with friends, this sofa will be cherished for years to come. The 2710 Stationary Sofa with Tall Wood Legs by Fairfield at Olinde's Furniture in the Baton Rouge and Lafayette, Louisiana area. Product availability may vary. Contact us for the most current availability on this product. 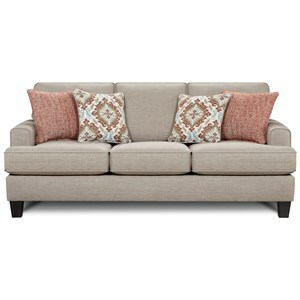 Furnish your living room or lounge area with the casual yet delicate style of the 2710 collection. Featuring a stationary sofa, chair, and ottoman, this collection has something the whole family can enjoy. Comfortably upholstered with box-faced seat cushions and padded camel backs, this collection is the ultimate in style and sensibility. With each item raised on tall tapered legs or framed by flair tapered arms, this collection is infused with a fresh, modern vibe that is gentle and relaxed. Perfect for a variety of occasions and locations within your home, this collection will be cherished by family and friends for years to come. 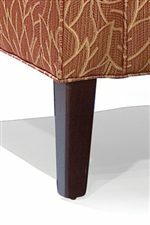 The 2710 collection is a great option if you are looking for Contemporary furniture in the Baton Rouge and Lafayette, Louisiana area. 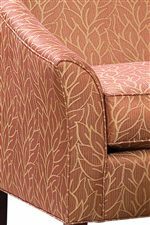 Browse other items in the 2710 collection from Olinde's Furniture in the Baton Rouge and Lafayette, Louisiana area.